[S918] GRO Scotland, death record, Parish of Ardchattan, Statutory Deaths, GRO 504/00 005, aged 78, farmer. [S612] GRO Scotland, birth/bapt record, District of Kelvin, Statutory Births, GRO 644/09 1107. [S651] Vital Record - BDM Archives of Ontario, birthdate given by her son Angus, who stated the year incorrectly. [S430] Census - 31 Mar 1901, UK census, Scottish GRO 644/03 110/00 019. [S612] GRO Scotland, birth/bapt record, Parish of Iona, OPR Birth/baptisms, GRO 536/00 0010 097; note this registration of her birth (not done until Sep 1855) is indexed by the GRO as 1850, even though the 1851 census shows her 1 month old in 1851. [S118] Census - 30 Mar 1851, UK census, Scottish GRO 538/00 003/00 009. [S917] GRO Scotland, marriage record, District of Blythswood, Statutory Marriages, GRO 644/06 0443. [S116] Census - 3 Apr 1881, UK Census, Scottish GRO 542/00 006/00 004 FHL film 203562. [S178] Census - 5 Apr 1891, UK census, Scottish GRO 644/03 116/03 022. [S687] Census - 2 Apr 1911, UK census, Scottish GRO 644/06 024/00 011. [S662] Passenger List - Catherine Jane McInnes, Angus Charles McInnes Mary McLeod, Scandinavian, 18 Sep1914; T-4813, Microfilm reels: T-479 to T-520, T-4689 to T-4874, T-14700 to T-14939, C-4511 to C-4542. [S651] Vital Record - BDM Archives of Ontario, Archives of Ontario, Series MS935, Reel 431, #38536. [S651] Vital Record - BDM Archives of Ontario, Archives of Ontario, Series MS935, Reel 455, #39709. [S612] GRO Scotland, birth/bapt record, District of Anderston, Statutory Births, GRO 644/10 0999. [S612] GRO Scotland, birth/bapt record, District of Kilfinichen, Statutory Births, GRO 542/00 0049. [S612] GRO Scotland, birth/bapt record, District of Kelvin, Statutory Births, GRO 644/09 0832. [S612] GRO Scotland, birth/bapt record, District of Dennistoun, Statutory Births, GRO 644/03 1330. [S612] GRO Scotland, birth/bapt record, District of Dennistoun, Statutory Births, GRO 644/03 0537. [S612] GRO Scotland, birth/bapt record, District of Dennistoun, Statutory Births, GRO 644/03 1072. [S247] Government Publication - US SSDI, SSN 480-12-3828 issued Iowa. [S681] Sth Dakota Marriages 1905 - 1949, at http://www.ancestry.com/, Registration No. 51-354. [S241] GEDCOM - A.C.W. de BLONK, GEDCOM de Blonk. [S247] Government Publication - US SSDI. [S443] CD - NZ Marriages, CD - NZ Marriages 1836-1956 V2, NZ Registrar General's Folio 6466. [S542] Index - New Zealand BDMs online, at http://www.bdmhistoricalrecords.dia.govt.nz/, Birth Reg. No. 1904/6053. [S281] Book - Florence Keene, Kaitaia & Its People. [S303] Cemetery Marker - , St Saviours Church cemetery, Kaitaia. [S932] BDM VIC Registry, birth record, Reg. No. 27872. [S934] BDM VIC Registry, marriage record, District of Darlington Derrinallum, 1930, no.11. [S502] Index - Victoria BDMs online, at https://online.justice.vic.gov.au/bdm/indexsearch.doj, Birth Reg. No. 27872/1899. [S758] Cemetery Entry - Carol Judkins, Camperdown, Australian Cemetery photos. [S502] Index - Victoria BDMs online, at https://online.justice.vic.gov.au/bdm/indexsearch.doj, Death Reg. No. 8001/1962, aged 64, mis-indexed under MCDONALD. 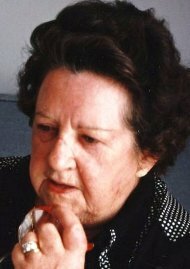 Sheelah Rosaleen McNAMARA was born in Glenelg, South Australia, on 3 September 1911. 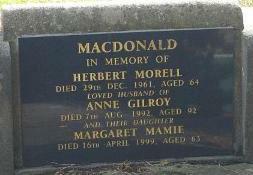 She married Gordon Noel MACDONALD, son of Herbert Alexander MACDONALD and Beatrice Isabel AYTON, in Sydney, New South Wales, on 9 March 1940. She was widowed at age 83 on the death of her husband Gordon on 3 December 1994. [S770] Newspaper - The Era. [S166] J W Forsaith, "Forsaith Family tree 1715-1942." [S189] International Genealogical Index (IGI), Ireland Births & Baptisms collection, Batch number C01187-5 Record group Ireland-ODM Film number 101096. [S871] FamilySearch, at https://familysearch.org/, Ireland Births & Baptisms 1620-1881, Batch number C01187-5 Record group Ireland-ODM Film number 101096 and Batch number C70123-8 Record group Ireland-VR Film number 101096 Reference number 2:LSKZ4P. [S877] Newspaper - Times of India, edition of 1 Dec 1896, Domestic Occurrences. [S938] National Archives - British India Office Records, Archive Ref: N/1/254, folio 81, Parish register transcripts from the Presidency of Bengal 1713-1948. [S190] Index - GRO and Office of National Statistics, England & Wales Civil Registration Qtrly Indexes, Death: District of Wandsworth, Vol 1d, p361, 3Q1938, aged 74. [S189] International Genealogical Index (IGI), Ireland Births & Baptisms collection, Batch number C70131-2 Record group Ireland-ODM Film number 101141. [S871] FamilySearch, at https://familysearch.org/, Ireland Births & Baptisms collection 1620-1881, Batch number C70131-2 Record group Ireland-ODM Film number 101141. [S677] Index - England High Court of Justice, England & Wales National Probate Calendar, probate in Llandudno to Irene Constance MacNAUGHT, widow. [S190] Index - GRO and Office of National Statistics, England & Wales Civil Registration Qtrly Indexes, Death: District of Aldershot, Vol 2c, p524, 1Q1941, aged 74, as MACNAUGHT.